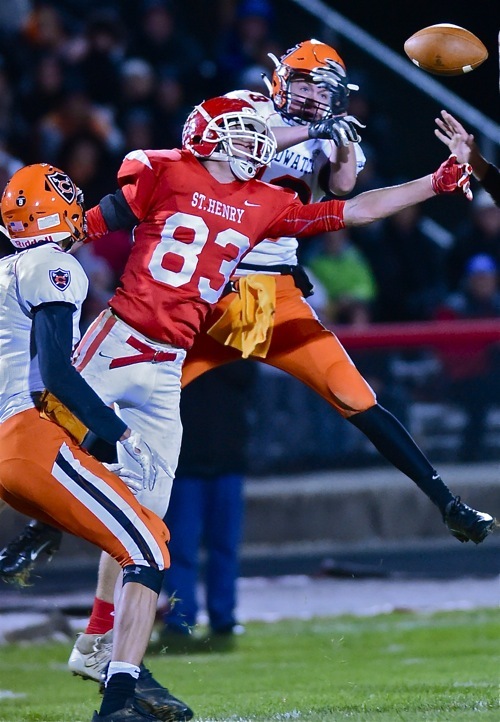 Like Once In A Lifetime…Streak Ends As St. Henry Finally Beats Coldwater! It took a complete and dominating effort to do it, and 218 yards and four touchdowns from Zach Niekamp, but St. Henry finally broke their Coldwater drought with a win over the Cavaliers. 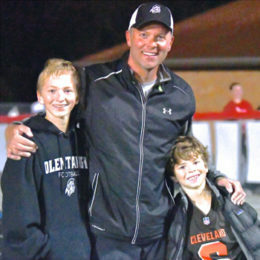 St. Henry – In his ten years as head football coach at St. Henry Jeff Starkey won two state titles (2004 and ’06)…but he never beat Coldwater! In fact, the last coach prior to Friday night to beat the Cavaliers was Press Pros football analyst Tim Boeckman, in 1996. Since then – 21 years and 22 games – it’s been a long dry spell, especially long for high school football. Zip, nunca, and nada, as they say south of the Mercer County line. But Friday night Brad Luthman broke the string, doing what Starkey couldn’t do as the 23rd time turned out to be the charm. St. Henry finally beat the Cavaliers, 28-10, in front of a packed and delirious crowd at the Wally Post Athletic Center. Ryan Uhlenhake with his sons, Sam (left) and Joe (right) was on hand to witness, and reflect on just how long 21 years is in football time. It had been a long time – long enough for the last quarterback to have won for the Redskins to have kids of his own and old enough to appreciate the feat. Ryan Uhlenhake was on hand to witness, and reflect on just how long 21 years is in football time. It took a heckuva’ effort, a dominating and complete effort. St. Henry’s biggest advantage, its offensive line, controlled the line of scrimmage and opened huge holes for the MAC’s top tailback, Zach Niekamp. Niekamp didn’t waste their effort, carrying the ball 31 times for 218 yards and four touchdowns. Quarterback Sam Lefeld was efficient passing, 7 of 9 for 75 yards. Quarterback Sam Lefeld, so maligned for the first six weeks of the season for his inability to throw the football, was ‘aces’ for the second time in two weeks, completing 7 of 9 attempts for 75 yards, but more importantly, provided the constant reminder to Coldwater’s defense that they couldn’t stack the line to stop Zach Niekamp. They HAD to respect the pass, as well. And really, who would have thunk it…that an offense that had struggled to get out of its own way against Anna and Marion would dominate in total yards, 321 to 190, and on the exact same number of plays (56)? 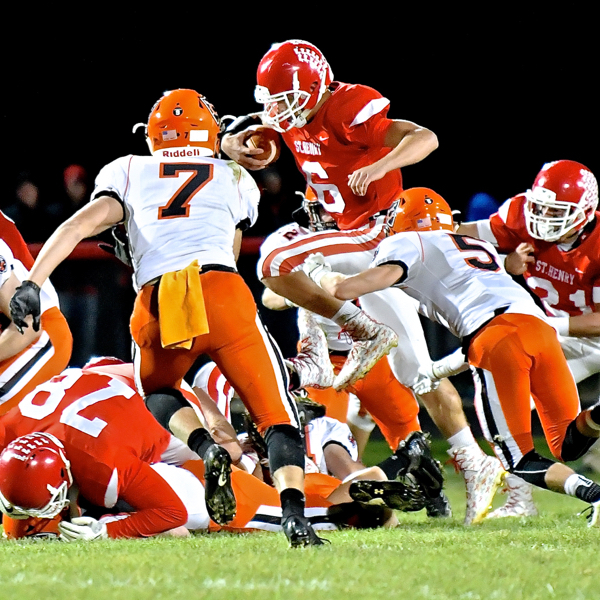 The defense rose to the occasion, too, holding Coldwater to just 190 total yards (115 passing and 78 rushing), and harassed quarterback Jake Hemmelgarn all night long. 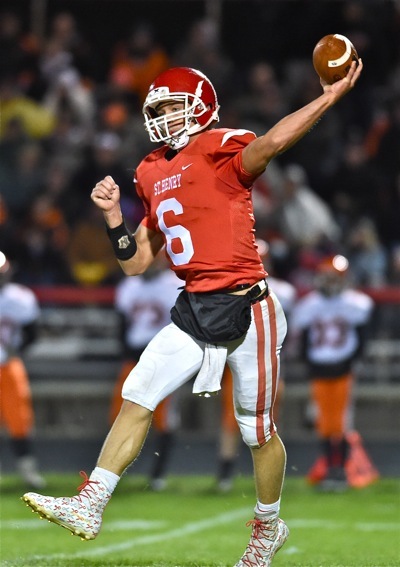 Hemmelgarn, who entered the game completing 71% of his passes with 21 touchdowns, connected on 16 of 26 (61%) on this night, and with just touchdown, a ten yard strike to Jacob Wenning in the second quarter. It was as good as Brad Luthman could ask, who smugly dismissed any personal accomplishment in deference to his predecessor’s much greater, ultimate accomplishments. They did, as previously stated, everything they needed to do to win, including getting off to a fast start. On the fifth play from scrimmage Niekamp got to the corner, turned upfield, and bolted 55 yards for his first touchdown to make the score 7-0. Five minutes later, at 3:03 of the first quarter Coldwater kicker Blake Dippold answered with a 21-yard field goal to make the score 7-3. St. Henry’s Jackson Heath tips a pass attempt away from Coldwater’s Will Broering in the second half of Friday’s Redskin win. And for a brief moment Coldwater actually took the lead…when Jake Hemmelgarn hooked up with Jacob Wenning at 5:26 of the second quarter for a 10-yard touchdown, 10-7, Coldwater. But brief it was, as four minutes later Niekamp cracked the goal line after a 7-play, 63 yard drive to retake the lead and go to halftime, 14-10. 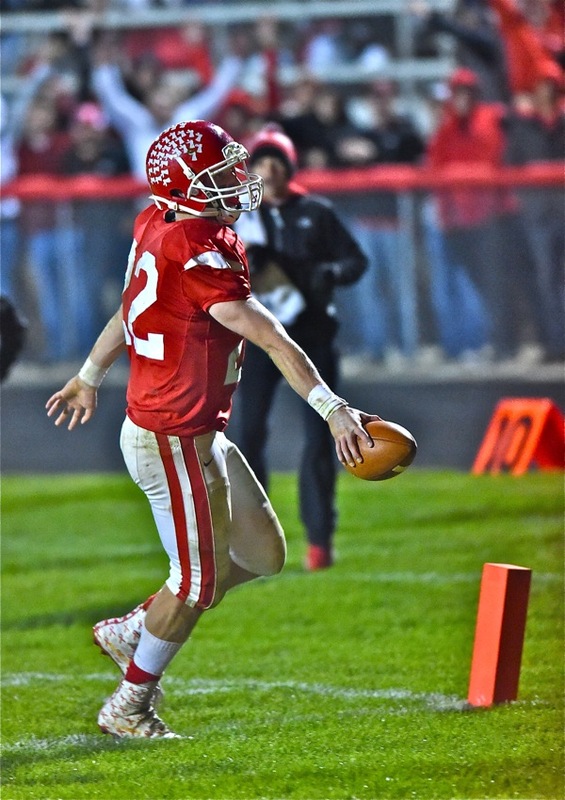 The second half was all St. Henry, magnified by a pair of Coldwater fumbles, some bad luck on a punt that ricocheted off a Cavalier’s leg that was recovered by St. Henry at midfield…and lots more Zach Niekamp. The senior tailback scored on a 28-yard run at 2:45 of the third quarter to stretch the lead to 21-10; and exactly a minute and ten seconds later, after one of those fumble recoveries, he slashed the Coldwater defense again for his fourth and final TD of the night to end the scoring, 28-10. It was a huge win for St. Henry, atoning for disappointments of the recent past, even as recent as the discouraging loss two weeks ago against Anna, when the offense resembled nothing in comparison to what it did Friday. Redskins Ethan Thieman traps the football against his helmet for a fourth quarter catch. Lefeld called it a total team effort. 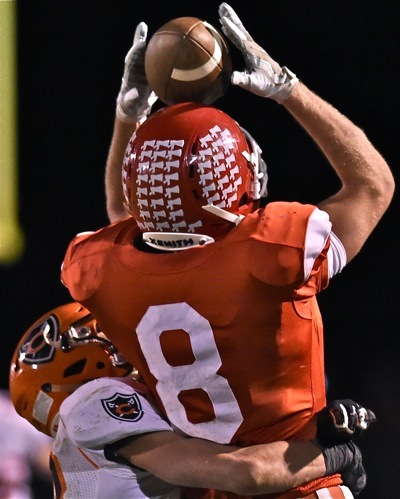 Make no mistake, the emergence of the passing game has helped Zach Niekamp, and is making all the difference in the world to teams that will prepare to play St. Henry from this point on. As a lot of people in St. Henry made plans to enjoy it, and all night long. Parties were already being organized even as the two teams shook hands and an obviously planned fireworks show went off over the parking lot. “I don’t know if it called for fireworks,” Luthman said of the moment, with a tinge of embarrassment in his voice. Moeller Brew Barn is proud to sponsor coverage of “THE MAC” on Press Pros Magazine.com. But without question, or comment, he enjoyed the appreciative gesture, perhaps symbolic of a new awakening of an old tradition in St. Henry. Jeff Starkey had a pair of titles, yes, but never fireworks. And for Luthman, Lefeld, Niekamp and those who have yet to even play, they vow that it’ll never take 21 years again. None of this once-in-a-lifetime stuff. They want Ryan Uhlenhake, and even Starkey, to be there…to enjoy it! Quarterback Sam Lefeld high-steps through would-be tacklers in St. Henry’s win over Coldwater.